The Blogosphere has been abuzz lately wondering about the winners of the 2007 UrbanSake.com Golden Masu Awards. I know people were concerned that 2007 would draw to a close without the sake blogging world’s highest honors being bestowed this year. Fear Not! Just in the nick of time, the 2007 Golden Masu Awards are here. This allows us to take a look back over the year and acknowledge some of the sake high points we’ve seen this year. It’s not every day that a fantastic Nigori enters your life. If the truth be told, I’m actually not the biggest Nigori fan on the planet… however, I can appreciate the stuff. One thing that makes a nigori really shine in my eyes is subtlety and Yuki no Bosha Nigori has that in spades. The nigori here is whisper-light and elegant with just a hint of texture. Made by a small artisanal brewery in the Northern prefecture of Akita, the taste is smooth and soothing – a real winner in my book. If you’ve never had a nigori, start here and you can’t go wrong. Namas in April and May really do herald the coming of Springtime. The best nama I had in 2007 was only available in the spring and I have no trouble thinking back to the taste of this memorable elixir. It was fruity with a strong strawberry-peachy bend. Yeah, just kinda yummy that way. The sneaky secret is the use of peach yeast in the making of this Okayama Prefecture brew. In addition to the big flavor, the name can be a mouthful, too. Let’s break it down: Kamikokoro (brewery name), Shiboritate (first run), Tokubetsu (special), Junmai Nama (unpasteurized/draft junmai), Genshu (undiluted/cask strength). hmmm. Maybe we should just enjoy the flavors. can’t wait for spring ’08! Fall Namas are a different beast from the springtime ones. However, they do have their own particular charms. They have that nama freshness, but taste more of the end of harvest than the buds of spring.I was able to try Urakasumi Fall Nama several times in 2007 and grew to appreciate it’s mild fruit, subtle flavors and balance. Miyagi Prefecture’s Urakasumi Brewery goes to the trouble to produce a fall nama and their efforts are rewarded. One of the key points of this sake is it’s tie to the changing of the seasons. They have captured the essence of Japanese Autumn in a bottle. we’re very lucky to be able to get it here in the states. Shichi Hon Yari or “The Seven Spearsmen” is a sake that keeps alive the Samurai Spirit. Anyone who has seen a PBS special on Feudal Japan knows that the samurai way of life was simply about honor, but also fierce and intense. Shichi Hon Yari is also an intense and honorable sake when chilled, but gentle warming brings out the intensity in this Shiga Prefecture brew. If you warm this sake, I guarantee you a sensory experience. You can almost feel it running through your veins. On a cold night the gentle warming of the alcohol is just what the Dr. ordered. The perfect thing to sip before any Samurai battle… or even for a quiet night in. They say you can’t tell a book by it’s cover… but sometimes you can. This is the case for the delicious, and deliciously designed, bottle of Tsukasabotan Senchu Hassaku.Being the only sake label I know of that screams out in neon safety-orange kanji, it immediately caught my attention. A cover like this better house an interesting book – and Tsukasabotan delivers. The flavor is rich and full, the nose hints and mild fruits, while maintaining an overall dry character. Yeah, it’s kinda punk rock. I might even brave a mosh pit to get my hands on Senchu Hassaku. I’ve fallen hard for the allure of Dassai 50. I was really lucky to visit this Yamaguchi perfecture brewery in Oct. 2007 and saw up close how they lavish attention on every detail. It’s really hand crafted. The reason I think this sake in particular is a great value is that it’s sold as a Junmai Ginjo, yet is milled to 50% which would allow it to legally qualify to be sold as a Daiginjo. Given the fantastic taste, attention to quality and a current retail price of around $25.00, you really can’t go wrong. While it’s no “2 buck Chuck”, This is a fantastic sake to introduce beginning sake drinkers to the joys of Nihon-shu. For me, 2007 was the year of Hakkaisan Ginjo. Simply put, I love this stuff. How do I love thee? let me count the ways! 1) Smooth and oh oh so drinkable. 2) Just enough richness and depth to keep the tastebuds activated. 3) That fantastic Niigata water doing it’s thing. 4)The crystal clear color of this brew sparkles in the glass. 5) A nose that any greek statue would envy. 6) Yum-o! Have you not tried Hakkaisan Ginjo yet? Well, get thee some, pronto. If you like smooth, clear and clean drinking sakes like I do, this brew may just enchant you, too. Well, there you have it. Congratulations to all the winners and I’ll be on the look out in ’08 for any new sake stars on the horizon… Kanpai and Happy New Year! If I had to be trampled at a sake tasting, I wouldn’t want it to happen anywhere other than Sakagura. Nihon-shu aficionados can be just like any other rabid fans out there: when the Star makes an appearance, everyone rushes the stage. So when the sake bottles were opened at the awesome Sakagura spring tasting event last Monday night, the crowd stormed the bar! One false move and I could have been sake road kill. Whatever the risks, attending any Sakagura tasting event is not to be missed! There were 30, count ’em, 30 sakes to try! From sugary-sweet to gin-on-the-rocks dry; from mountain-spring-water clear to ultra-rich-velvety-floral: There was something here to please anyone’s palate. Scott & I had a reservation for the 9:15 seating and the place was sold out. This is an Event! Here’s how it worked: The venue had two seatings for the evening. Once seated, you were given a sake chart for taking notes and a special limited menu of delicious food to compliment the sake. All of the sakes out for tasting were lined up along the bar with a Brewery rep or sommelier in charge of 3-4 bottles that they would pour you a tasting of upon request. So you would end up visiting the bar to sip a few new sakes, then sit down and enjoy some food – rinse and repeat. Your basic eat, drink and be merry! One thing I have come to love about sake tastings is how people really come together when the “Sake Magic” takes hold. For example, Scott and I had such a nice chat with our neighbors at the next table Rob and Tamara. Hi guys! 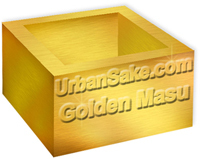 Since it would be really hard to taste and describe all 30 sakes, I have decided to highlight the best, boldest and weirdest brews by launching my very own award: The UrbanSake.com first-ever ‘Golden Masu’ Awards! Just like the Oscars! but only on my blog. And there’s no red carpet. And the Masu goes to: Kubota Hekiju! Kubota Hekiju (Junmai Daiginjo, Niigata Prefecture, SMV=+3.0, Seimaibuai=50%) is one of my all-time favorites. This sake is smooth and lovely. It was a joy to taste it again at the Sakagura tasting. This is one of those old favorites that feels like slipping on a much loved cashmere cardigan when you take a sip: Instantly familiar, soft, comfy, smooth and utterly delightful. This is also one of my favorite “conversion” tools. If a friend is “Sake-Curious” but a little wary, I may start off with a perfectly chilled glass of Kubota Daiginjo. One sip and a Sake-Fan is born! And the Masu goes to: Kokuryu! When I tell people about my interest in sake, a lot of people respond by saying “those sake bottles are so beautiful”. They are! However, Kokuryu (Daiginjo, Fukui Prefecture, SMV=+4, ALC=15.5%) takes it too a whole new level. With Gold Glitter Kanji (! ), and a dark chocolate background, it looks like this bottle just finished up a nite at Studio 54 and is on it’s way to the after party with Bianca and Liza. The very best surprise? Glitter Label is not all just flash. This sake tastes as good as it looks. It’s got a smooth clean taste, and to my palate, a slight hint of berry. Yum! I Loved it. This would be a great sake to order when you’re out with friends for a night on the town. The party will begin the moment this disco ball bottle hits the table. And the Masu goes to: Dassai Nigori! Everyone who starts to learn about sake usually picks up the Junmai–>Ginjo–>Daiginjo concept pretty quickly… but then they learn there are variants out there. Aged Sake, Cedar-Tinged sake, Unpasteurized Sake, and then.. cloudy unfiltered sake with bits of rice swimming in it?? It can be a lot for a beginner to take in. Enter Dassai Nigori (Junmai Ginjo, Yamaguchi Prefecture, SMV=+3.0, Seimaibuai=50%) . This nigori is very friendly for the beginner – and it’s the sake I would use to introduce “alternative-style” brews to your friends. It is creamy with a wonderfully even texture – not chunky or to thick like other nigoris. And in the background is the wonderful Dassai attention to quality. One of my favorites! And the Masu goes to: Kasumi Tsuru Shiboritate! Not every brewery could say, “My Sake could beat up your Sake.” but this one has got the chops. Kasumi Tsuru Shiboritate (Honjozo , Hyogo Prefecture) has a unique one-two punch. First, it’s a nama (unpasteurized), which gives a larger, more expansive taste, and second, it’s an genshu (sake not diluted after brewing), which gives the pow of a higher alcohol content. This type of sake is great on the rocks or when you want a real attention-getter. Just be careful not to drink to much or you really will be down for the count. Imported by Joto Sake. And the Masu goes to: Karen! Karen (Junmai, Niigata Prefecture, Ichishima Brewery) is one pink girl. The packaging designers got it right on this one. The Ã¼ber-pink bottle perfectly captures the taste: Think cotton candy, bubble gum, Malibu Barbie’s corvette. It’s an interesting niche in the sake world, though. It may not be my taste, but i haven’t seen a lot of brewers specialize in the much sweeter brews. This can be a great change of pace when only something sweet will do. If that’s your thing, be sure you have Karen’s number in your little black book. Just don’t call her Barbie by mistake – she hates that. And the Masu goes to: Ken! Speaking of Barbie, she knows better than anyone that Ken is a perfect Gentleman. This is true for the delightful and truly charming Ken Daiginjo (SMV=+4.0, ALC=15.5%). Again and again, i’ve been wowed by this sake. oh Ken… I wish I knew how to quit you!! The taste is clean, clear and smooth without being weak or watery. It’s got a taste I can only describe as the essence of “Sake-ness”. what the heck does that mean? it’s got the best aspects of many sakes I’ve had all rolled up into one, while still being elegant. It’s really something special, so I’ve called it here “best in show” although it really is impossible to pick a “best” at this tasting. Every person out there will find their own personal best. Congratulations to all the winners! Well, all in all, it was an amazing evening! I’m looking forward to my next tasting at Sakagura – they really know how to put on a show. If you get the chance to attend, don’t miss it – and remember, it’s an honor just to be nominated.